My main source of irritation would be the scripting. I'm pretty fluent in c++, but nwscript seems a little unpredictable to me... For this reason I've decided to just start the code from scratch, while using what I've learned to make it better. As a software developer, I can relate, having projects of my own where I often reset from scratch. It just means it's going to be a little longer until we see a release, but with the intention of having a better product in the end. Tech is wrapping up and we're hoping to finally start working on implementing the content. Great news from the Lazarus team! Great work folks!!! We're all looking forward to your release. The Exult team posted an update saying that the development version now has an in-game journal and also uses Pentagram's audio subsystem. Gradilla Dragon (of NU5 fame) posted a brief update that he figured out the signs.dat format and will be writing a map viewer. The Nuvie ChangeLog lists a few bugfixes and the addition of some visual effects. Hello! Much has changed in Pentagram since we last wrote about it. The project authors have added sound effects, speech pack support, the intro and endgame sequences, save and load support in the diary, special effects for magic weapons, working magic foci, video/audio game options, and a slew of bugfixes. Whew! Got this message from Dennis Schenkel (Major Error), the new author of the U7 Agape project. U7 the Agape project is dead, since October 2004. (Both founders are no longer working on the project) However I myself have been working on a U7 remake for the NWN engine. Withstand the Fury from Aiera site saw my early screenshots and allowed me to take over the hosting of the Agape site. My version of U7 part1 the Black Gate is currently in early stages, so there is no new website details yet. 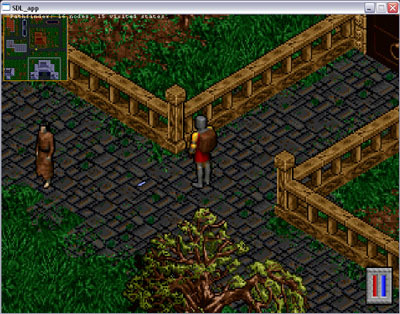 However i do have some early screenshots to show on the forum: http://aiera.timeimmortal.net/forum/viewtopic.php?t=73 and some early screenshots of Trinsic are found here: http://www.dennis-schenkel.com/ultima/screenshots/Trinsic_overviewoldnew2.jpg http://www.dennis-schenkel.com/ultima/screenshots/Trinsic_overview1.jpg. When i have time to set up a new Agape site i will show more screenshots and tell more details. The pics look fantastic so far! Can't wait until the website revamp to hear the latest news on the project. Keep up the good work! Happy Easter folks! After some digging around the dust-covered and mouse-ridden basements of the Lycaeum, I stumbled across two important finds: a mage's formula for a mini big bang (check out the vid!) and this site's old news postings. Okay, well not exactly... I just added some code to get to the archives. Sadly, there were no postings at all last year. But for any who are interested, you should see the links on the left-nav by year. This set of remakes aims to authentically recreate U0-6 as accurately as possible with optionally upgraded graphics and sound. As of v0.1.0, it is tested to work in Linux and Windows. the next version, v0.1.1 (not released yet) is tested and works in bsd. The goal is every *nix (including OSX and linux PDA's, every windows (including CE) and consoles (dreamcast, ps2, xbox, etc). The Ultima 6 Project seeks to reinvent the world of Britannia during the events of the False Prophet using the Dungeon Siege engine. In addition to recreating the land and its people, Team Archon has expanded the plot to feature a world torn by war and intolerance. More plot-based than its predecessor, U6P will unravel the origins of the Gargish lands as well as produce a new adversary of the Avatar - a gargish hero who believes the only way to avert the prophecy is to understand our protagonist. Enveloping the events of U6 will be an overall arc that ties the events of the game into those of Ultimas past and future. Oh... and you'll be able to solve Quenton's murder, but you won't be able to clone magic shields. Rather than promising dates and missing them, our official stance is it will be released when it's done... I will say that we are still in our infrastructure building phase. We're trying to get to the point to where all of our technical systems are solid enough to start massively laying down content without having to worry about doing a lot of rework if the underlying systems have to change. This is definitely the slowest part of the project and the phase we've been in for the last 1.5 years I've been on the project (maybe longer). The good news is that things are really starting to come together and we've begun laying down plans for populating the world. There you have it folks! Despite some fears to the contrary with the lack of news on their site, the U6P project is alive and well, just moving along at a steady pace. Lost Sosaria - by Withstand the Fury Dragon, auth of the Ultima: Aiera site, this is a NwN module chronicling the adventures of some of the Avatar's companions to the other two missing contients of Sosaria. Since the module is fairly large, I haven't uploaded it to the site yet, but will in the next few days. Ultima X: A New King - under construction by the authors of the U9 Redemption remake, the Titans of Either, and slated as its sequel. Unfortunately, there appears to be very little information available about this game other than it is allegedly in the works. Sadly, the Adventures of Blackthorn no longer appears to be under development and has been removed. Press the backquote (`) key to open the console. It is the quote above the TAB key. Type in the command "MiniMapGump::toggle" and press ENTER. The minimap should appear. Close the console with the backquote key again. Kudos to the Pentagram team for bringing us a great new feature! Quite a few important project updates have been posted today. For starters, we'll begin with the Ultima 4 remakes. That's right, remakes (plural). There are now two: Avatarship, whose latest files were available on NW Vault long after his site went down; and U4 Reborn, a smaller-scale U4 remake. Both modules use the NeverWinter Nights engine, and both have released their final (completed) versions. Many thanks to Withstand the Fury Dragon for pointing me to these projects on NW Vault. U5 Morrowind Mod - a remake project that aims to build U5 under the Morrowind engine. The author is currently capturing images for use as textures with his new digital camera. U7P1 Agape - a remake of The Black Gate under the NeverWinter Nights engine. Unfortunately, it appears there hasn't been any updates on this one since September, but we'll keep our eyes peeled for another update. U9 Infinity Eternal - a remake of Ascencion using an enhanced version of the relesed plot, which, according to the screenshots, will include Serpent Isle! A demo of Buccaneer's Den is also available for download. Unfortunately, there haven't been any updates since November when the author decided to switch from Morrowind to the Oblivion engine. This may simply be because Oblivion (The Elder Scrolls IV) has not been released yet. UGCK - like TSSHP and UW Adventures, the Underworld Game Creation Kit is a remake of the Ultima Underworld engine using the original game's data files. Finally, I've updated TSSHP and UW Adventures to their latest versions, 0.2.10f and 0.9 respectively. That's all for now! I decided that nu5 will use a client-server architecture. There will be separate client and server programs, and there will be a library for their intercommunication. The server will handle the game state, will feed the client with the pertinent information. The client will be the player interface, handling graphics, sound and input. In the current roadmap we contemplate a "classic" pure client with only minor enhancements (digital music and sounds, filtered graphics), and keep it like that, very simple, with no bloats or additional goodies. We will provide the community with the library to communicate with the server, and hope that new enhanced clients start popping up. We will concentrate more on the server side, and may add new functionality to the server and communication library as seen fit. Currently, work has been started on the communication library only. I can't guarantee starts on the client anytime soon (it will certainly come before the server), but I have been thinking about it for quite some time. Ultima I, II, and III have been ported to the PalmOS! The games are shareware and the full versions can be purchased from the project website. UtR is hosting the limited demo versions for download. I don't have screenshots of the game yet (anyone know a good tool that works on animated gifs?) but will hopefully soon. Also under the O/S ports section, I merged the Ultima 1 and Ultima 4 for Java projects under the Ultima-Java project. There's no trace that Philippe ever released U4 for Java that I can tell, but if UltimaJava continues its development path, we may see it again. Two popular remake projects have made some considerable progress over the past few years: U5 Lazarus and The U6 Project. Both projects have produced tech demos that run under Dungeon Siege, and they are now available for download on this site! They are fairly large and will take a long time to download. In other news, two projects did not withstand the test of time. One is U7 Remixed and the other is U4 Dawn of Virtue. If either project had made any demos or software available for download before vanishing, they would remain listed on this site; but alas they did not, and have therefore been removed from the 3D remakes page. First, the fan resource links to the right have changed slightly. The original remake information site, Fans for Ultima, was shut down a long time ago. In it's place are two excellent sites that provide frequent news and updates on remake projects. The first is Ultima: Aiera, a joint project by Withstand the Fury Dragon and Dino Dragon. And the second is UltimaDot, an RPGDot site. Check them both out! They're really great sites. Also added some links to a few game forums where the remakes are often discussed. Also, I now believe the Classic Remakes section now has the most current information on all projects. U3 Project now has a release available, the Exult downloads were updated to version 1.2, the final versions of Virtue of Humility are posted, and xu4 is at version 1.0 beta 2. Also Pentagram is no longer just a U8 object viewer. (though the viewer is still available for download) You can now play parts of the game! Nuvie - an opensource clone of the U6/SE/MD engines; this one looks EXTREMELY promising! Much more news and updates to come! Stay tuned! I know it's been a loooong time since we've had any updates here. Almost two years! Whew! I have received many emails from folks asking about the status of this site, passing links to new remake projects, or just to say they loved the site. To all of you, thank you for your interest and your patience! And I hope you'll be glad to know that the more frequent site updates are returning. Some of you may or may not have noticed during your visits over the past two months that certain aspects of this site ceased to work properly, and then magically worked again. I have been working on upgrading the back-end for this site, something I had intended to do for over two years, but finally began in January this year. Basically, project updates became a burden because the back-end was so limited that I often made database updates directly; and the back-end code was not exactly the most modular for a webapp, meaning I had to tackle a complete rewrite to fix many of the issues. All that and the ever-increasing demands of life made it impossible to continue working on the site. The new updates are the result of experience with other webapp frameworks designed to make life much easier for a web programmer. So to sum up, it's now simpler to make additonal changes to the back-end and to post updates to this site, which you will begin see more of in the coming days/weeks/months. For starters, here's my first update. Several projects have changed homepages over the past few years, and the UtR has updated its links to point to their new sites: TSSHP, U2 Enilno, U7 Wizard, U8 Exile, Pentagram, and U9 Redemption. I have a ton of updates I plan to make on this list sitting on my desk, so stay tuned! There will be more coming relatively soon.